BODY - SignOn - Connect. Practice. Retain. 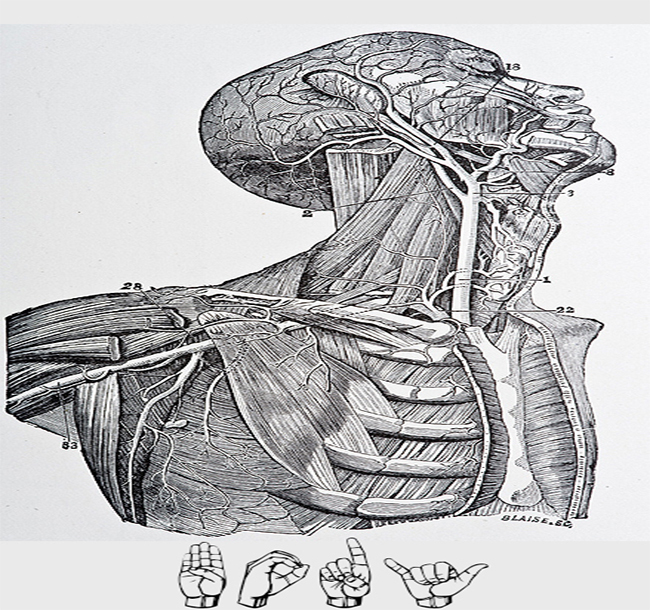 In general, most body parts are just pointed to or fingerspelled. * HEAD – With a Bent B hand touch the upper part of your head (at the temple) and then move down to touch near your chin. * FACE – CL: 5 circles in front of your face. Alternative sign is to circle your index finger in a circle in front of your face. * ARM – The dominant flat hand shows the length of the non-dominant arm. The tips of your fingers brush along your non-dominant arm (from the lower bicep to the wrist). * HANDS – This sign looks as if you are cutting off your hands at the wrists. Use the outer edge of the right b hand to “slice off” the left hand. Then use the left b-hand to slice off the right hand. * BODY – Touch your hands to the top of your torso, then move your hands to the lower part of your torso. Alternative sign is a one handed version in the middle of the chest to torso. * LEG – Similar to the sign PANTS but only do one “leg”. – How do you take care of your Body/Health? – Do you think you are Healthy? – Ever broken a bone before? How? – How many times you’ve been in a hospital? – Do you have a scar? Where? From what? – Do you bruise easily? – Do you have tattoos? Where? – Are you an organ donor? Why/Why not? Now, make this extra challenging and only answer the above questions in descriptions instead of pointing. For example, you have a tattoo on your calf – use classifiers and signs to describe where it is on your body instead of pointing to your calf.